They are so colorful and make anything that much more fun. Don’t you agree!? For me, sprinkles just make me happy and they always put a smile on my face. And another thing that puts a smile on my face is this Homemade Funfetti Cake topped with my favorite vanilla buttercream frosting. This Homemade Funfetti Cake is a delicious, light and fluffy cake that not only tastes a million times better then a cake box mix, it’s also super easy to make. This cake is filled with my favorite Rainbow Sprinkles, if you follow me on Instagram, you saw that I just received a ton a bags of SPRINKLES in the mail the other day. So I couldn’t wait any longer to use all the sprinkles I got, and that’s when I decided I had to make my favorite Homemade Funfetti Cake! ✔ It is EXTREMELY IMPORTANT to make sure that you really whisk together the flour and baking powder so that the flour mixture is mixed well together and not clumped together. Not whisking the flour mixture well enough, will result in an overly dense cake. You want the flour mixture to be light and fluffy. 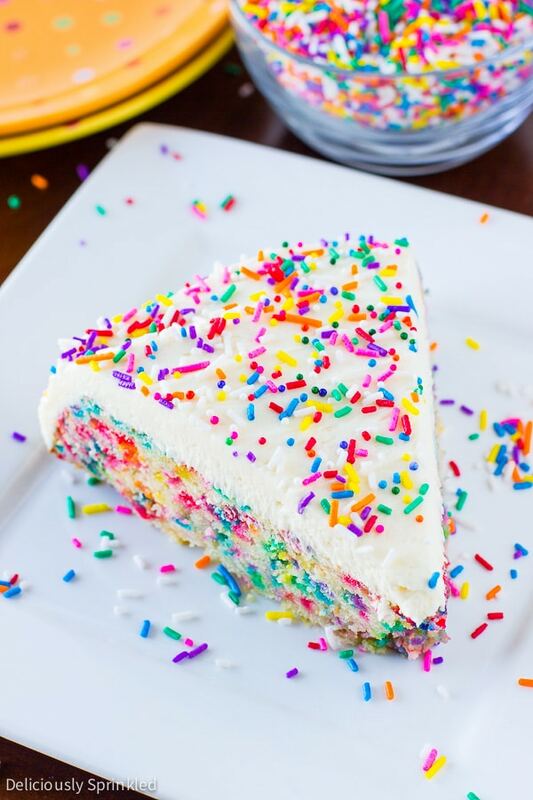 ✔ I used whole milk in my recipe because it gives this funfetti cake the perfect moist texture. You could also use heavy whipping cream. If you HAVE to…you could use regular milk but the cake might not be as moist. ✔ I used my favorite Vanilla Buttercream Frosting, you can find my step-by-step photos on how to make my Vanilla Buttercream Frosting here. And of course, it would not be a funfetti cake without topping the frosting with more SPRINKLES. I buy all my sprinkles in bulk here. PRE-STEP: Preheat oven to 350F degrees. Spray a 9-inch cake pan with non-stick cooking spray. Set aside. STEP 1: Whisk together flour and baking powder. Set aside. STEP 2: Cream together butter and granulated sugar until light and fluffy. STEP 3: Beat in eggs. Add vanilla extract until combined. STEP 4: Add flour mixture to wet ingredients. Alternating between flour mixture and milk. Mix until combined. STEP 5: Stir in sprinkles. STEP 6: Pour batter into prepared cake pan. Bake for 30-40 minutes or until toothpick inserted into center comes out clean. Let cool completely before frosting. STEP 7: Mix softened butter on medium speed with an electric or stand mixer. Beat for 1-2 minutes until smooth and creamy. STEP 8: Add powdered sugar, heavy whipping cream, and vanilla extract. Increase to high-speed and beat for 3 minutes. Add more cream if needed for spreading consistency. STEP 9: Frost cooled cake and top with sprinkles. *Want the perfect rainbow sprinkles to use? I buy all my sprinkles from here. 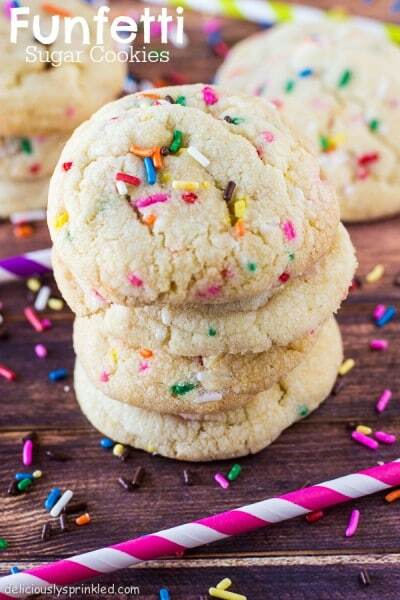 Try these Funfetti Sugar Cookies next! 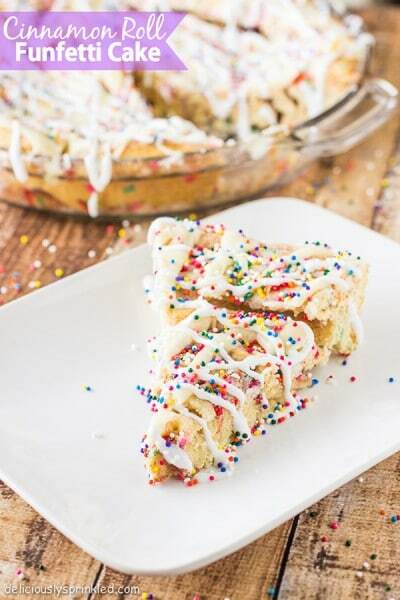 And this Cinnamon Roll Funfetti Cake is a family favorite! I love how colorful and fun this cake is! Funfetti is seriously the best for birthday parties! I had to bake this for school and all the kids loved it my plate was theost asked for. Im happy i made this cake. HEY! i make this cake for my sister’s birthday, but im not sure if the butter for the cacakeatter is salted of unsalted. 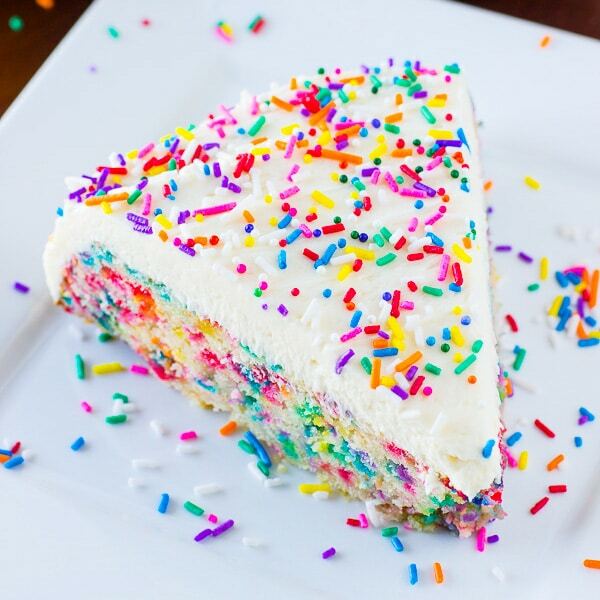 I love how fun this funfetti cake looks! So I had to make it! Super easy and so super yummy! Thank you Jenn for this wonderful recipe! This is such an awesome cake! Sprinkles always bring a smile to my face! 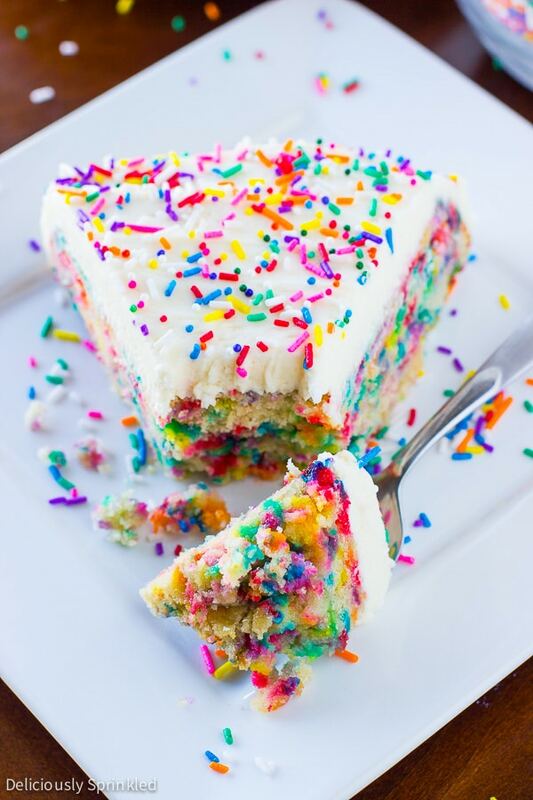 This funfetti cake is perfection and just makes me so happppppy! Looks so yummy! This cake shouts “Happy Day”. When I was younger, my stepmother would randomly make cakes on Tuesdays, evenings, or whenever she had a box of cake mix lying around…she called them “Happy Day Cakes”. They were almost always chocolate, but this Homemade Funfetti Cake is way too bright and colorful to not be a “Happy Day Cake”. 😀 I love it.